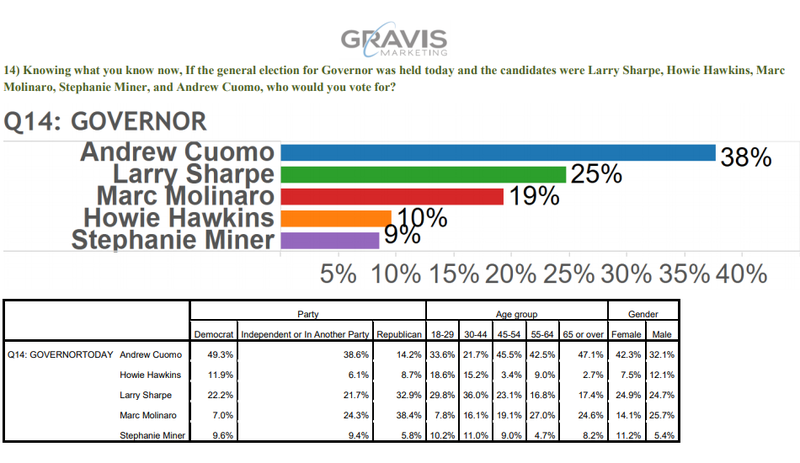 Gravis Marketing released it’s latest survey of likely voters with Cuomo at 48%, Molinaro at 25%, Sharpe at 13%, Miner at 8%, Hawkins at 6%. New York, NY – Gravis Marketing released a new survey of 783 Likely Voters this morning, asking voters how they planned to vote in the upcoming gubernatorial election. Among the voters surveyed Democratic Candidate Andrew Cuomo polled at 48%, Republican Candidate Marc Molinaro polled at 25%, Libertarian Candidate Larry Sharpe polled at 13%, Serve America Movement Candidate Stephanie Miner polled at 8%, and Green Party candidate Howie Hawkins polled at 6%. The poll has a +/-3.5% margin of error. “This poll shows that we’re continuing to gain momentum with New York voters.” says Libertarian Candidate Larry Sharpe. “When people know who I am, when people hear our message, my campaign polls even better. We’re seeing the results of our efforts at events throughout New York State.” Follow up questions within the poll asked respondents about various policy issues and whether they were aware of candidate issue positions. After these questions, the respondents were asked again about their preferences for governor with Andrew Cuomo at 38%, Larry Sharpe at 25%, Marc Molinaro at 19%, Stephanie Miner at 9%, and Howie Hawkins at 10%. At present time, Governor Andrew Cuomo has not agreed to debate any candidates for Governor. Larry need to get out the word in Albany area and surrounding areas. While driving out to Albany area seen very few gov signs and Not one Larry sign. We need you in office. Need to peak their interest. Wow I am for all you are fighting for ! Don’t give up – give us hope . I am not living in your state . Boy I would like to if you were governor! “ I want a religious exception with no pictures . To have rights again with out bullying. “ I am the only one in us refused public assistance . Was ok I raised my children working Manuel labor many jobs .i worked hard with many who despise you even so . I have nothing I could put forward to help you get in that we so desperately need you . Just a heart beat and breath for hope again for our nation . Thank you for stepping up for good of the people – may their be good people left in our nation to step up for getting you in as governor sir ! Thank you !!!! These polls are a joke. I got a call from one. Larry Sharpe wasn’t even on them. I could only choose between GOP and DEM. T Remember, shortly before Trump won, the polls said Hillary was leading 92% to 8%. he real poll, and the only one that counts will be on election day. Larry- I have to admit that until today I had only heard your name in passing. To me, the thought of a 3rd party candidate went out the door when I “wasted” my vote on Ross Perot all those years ago. The two-party system is SO entrenched that I fear good, decent people like you will never get a fair shot in politics. That said, I applaud you and congratulate you because I feel for and relate (unfortunately and ironically) to what you went through to get where you are. I apologize in advance for the following which seems all about me but I think it’s important to lay the foundation of why someone like me, can out of the blue take a minute to say, “What the hell- why not take a minute to check this guy (you) out”, peruse your website, and instantly feel a bond. The issue is that the stigma and repercussions never went away outside of family. Life is strange though. Irony of ironies, I met, dated, and married the daughter of a narcotics detective. Really- that’s not a lie, lol. We’ll be married 24 years next month and we have two great boys; 20 and 17. Also, like you, I am involved in a small (family) business that I recently bought out completely last year. I had a fall out with the business- CNC machine shop (job shop- no products of its own) around 5 years ago when my father was contemplating retirement and I was forced out by the General Manager who took over operations. While it wasn’t related to the “crash”, the business took a marked downturn in my absence and nearly four years later, I bought it back with the hopes of turning it back around. However, I have kept my options open- and paychecks coming in- by continuing to run the machine shop of a wonderful company named Conax Technologies. They were aware- and somewhat leery- of my felony past but in this case decided to give me a shot because of my many years of practical experience in the machining industry. Most people “with a record” aren’t fortunate enough to be able to amass that experience and would have been out in the cold; no second chances. That is wrong and luckily there is someone like you to see it. So to recent history… I applied for- but was rejected for- Global Entry clearance when traveling. For those not familiar with it, in its simplist terms, it’s US customs pre-clearance to bypass the long lines when coming back from overseas travels. My wife and I applied; she got it while I was denied solely because of the 30-year old felony. No one cared to hear my story or pleas- they only cared that my record said, “felony”. Where is the justice in that? My worst offense in 30 years is a speeding ticket. Second chance? Not today. Where am I going with all this? Back to your story. The more I heard while listening to WHO IS LARRY SHARPE? the more it hit home; again, and again… and again. Especially hard- and directly hitting home- was listening to the story of your mom and her addiction and subsequent record, her medical interventions for cancer, and your little girl and her major health trauma. How does any of my history relate to that? Because my wife- a public school teacher- was recently diagnosed with ALS. Out of the blue, it came on quickly over the past year at age 48, with her hands now being almost useless, falling down more and more often, and having more and more trouble walking. Will she be the 2-5 year life expectant or the Steven Hawking 25 year survivor paralyzed in a wheel chair with breathing apparatus, or something better in-between, or something worse? Time will tell. My faith is shaken to its core- but not broken- and I believe it’s important to maintain that. The average person seeing your video can sympathize with you but they can not honestly say that they relate to you. I can relate on pretty much every level. I FEEL your journey; I FEEL your pain; I FEEL your need to get a break and somehow set things “right”. I wish you the best and God-speed to your goals. I took the time to meticulously read through each of your “Sharpe Policy” bullets and without exception I agree with each and every one. I find it HIGHLY disappointing that today is the first time I heard of any of them but at the same time, HIGHLY rewarding that there is someone like you, with whom I share a somewhat similar history, out there fighting the good fight. I will pledge here and now my vote for you. While it’s likely to be another “wasted” vote like my one for Perot, since no party can overcome the Democrat stronghold in NY- the sheer “sheep” population numbers in the NYC and Albany areas prohibiting it- I will cast that vote anyways. Sometimes though, just knowing someone else is in your corner fighting with you is enough to make things better all by itself. So if nothing else, I want you to know you’re not standing alone in that corner. God Bless. Congratulations! You made history! The Libertarian Party Of NY has now become ‘official’! You are an excellent ‘face’ of the party. Thank you. And many thanks also to your team. I hope you all stay actively involved in the liberty movement.